Today’s blog post is unique and one that I’m very excited for. I recently polled several women who struggle with feelings of overeating, emotional eating, and the associated guilt that often follows. The following are actual questions I received and today I’m going to answer them for everyone! If you find yourself struggling with emotional eating, overeating, guilt, mindless eating, or anything associated with having a difficult relationship with food, I hope you’ll get some answers you need from today’s post. In fact, I’ve created a guilt free holiday (but not JUST for the holidays!) workbook to help you navigate the 3 top struggles women face when it comes to food, events, parties, and emotions. If you are reading this and it’s not the holiday season, I’m certain this workbook will still be so helpful for you as creating a healthy relationship with food is a lifelong process. Without further ado, let’s get to the questions and answers! This is a classic sign of emotional eating. Emotional eating is not just about eating ice cream on the couch while watching a chick flick. Not even close. It’s about using food as a soother for your emotions. Emotional eating can occur anytime you experience an emotion. It can even be in response to a celebration or feeling happy! If you want to learn more about overcoming emotional eating, here’s a blog post with 5 steps to helping you overcoming emotional eating and make peace with food. And if you’re really ready to dive in, I’ve even created a free mini course that focuses specifically on understanding emotional eating and creating your own plan for dealing with it. You can sign up for the free course here. To simplify a very complicated topic, let’s break it down into actionable steps. When you have the urge to eat, take 30 seconds to stop and think about where the urge is coming from. Are you angry and craving a bag of chips? Did you make it through a hard day and just want a treat? Notice what emotions you are experiencing. That’s all you have to do is take note of them! The second step is to act. Act on the emotion. If the emotion is anger, what will help you calm down? How will you feel if you eat that bag of chips? Will it calm you down, or would a walk instead? Pick one emotion, then find one non-food way to deal with it. If you’re still hungry when you’re done dealing with it, then allow yourself to mindfully eat the food you want without guilt and without overindulging. I know what you mean! My favorite reminder of this is when we go to the movies and make it through the popcorn before the previews are even over! In fact, if you want to read a little more about my story and background with intuitive eating, head here. Not knowing where your food goes is often a good indicator that you are eating while distracted. I actually have a free quiz that will help you identify your eating style if you’re curious! If you find yourself plowing through your lunch during work, snacking in the car, or grabbing food to scarf quickly, I have one activity for you to do. And because I know you’re busy, it will only take you 15 minutes once per week. Choose one meal per week (of course you can do more if you’re up for it) to sit down and eat mindfully and then follow my mindful eating meditation outlined below. At the end of the meal, rate your hunger again. Take note of how your body feels. Are you satisfied? The goal is to stop eating when you are at 80% full. Or a level 7-8. This is a good measurement of satisfaction and fullness. Then, when you’re out and about, you can take what you’ve learned and apply it exactly the same. It’s 100% unrealistic to expect ourselves to be able to sit down and mindfully eat a meal at the table every time we have to eat. This is a great way to help you learn to eat mindfully on the go. In fact, I have a blog post allll about this if you want to check it out. "I tell myself I’ll eat just one of something, and then again, eat way more than I intended." "I have a hard time saying no to multiple invites to dinner. And once I’m there, it’s an all-you-can-eat buffet. I can’t portion control. I can’t say no to anything unhealthy." The best thing I can say to this is to PLAN, PLAN, PLAN. It’s ok to enjoy parties and events. It’s good for your mental and social health. But, if you’re constantly worried about the food, then you’re really going to struggle every time someone invites you to an event, party, or restaurant. You CAN eat mindfully even when there is a lot of food around. But, you need a plan. A flexible plan that will allow you to enjoy and feel in control over your choices. As far as tips go, here are some actual plans from past clients that have helped them create and stick to a plan. Ah, we’ve all been there. The guilt. The frustration. The feelings of failure. The good news is that it’s all completely normal. Even seasoned intuitive eaters find themselves in this situation from time to time. You can read all about making a plan and sticking to your goals in the questions above, but for this one we’re going to focus on what to do if you mess up your plan or have any feelings of guilt after certain food choices. It’s all about self talk. In fact, let me guess that the last time you felt guilty for eating, you probably turned it toward yourself. Did you say things like, “I’m a failure”, or “I’ll never have any control over food”, or “I have no self control”. We often tend to place our feelings about food on our actual selves. We turn a certain episode with food and pair it with our identity. So, the next time you feel guilty for overeating, try the powerful self talk method. Second, focus on 3 good events you’ve had with food this week. Remind yourself that this was a slip up, and that’s it. You don’t have to make it a habit. Third, create one self-talk mantra you can say to yourself to help you when you want to slip up next time. It could be something like, “Remember how eating so many cookies made you feel last time? Try having 2 this time and stopping to notice how your body feels. Then go somewhere away from the food”. Create a simple scenario in your mind, practice it, and then you’ll remember it the next time you find yourself in that same situation. But always remember that we are human. We will mess up. Perfection is not the goal. Progress is the goal. The holiday free-for-all. We know it so well. It’s the holidays, we might as well eat, drink and be merry… until January 1st. This is a loaded subject with more answers than I can give in this blog post, but rest assured I will be doing more posts about this in the future! And I know it’s something we struggle with throughout the year when holidays come and go. We think we’ll do better on Monday, or after that holiday, or when we have a wedding to go to, or a beach vacation. Again, I cannot stress enough that the key to a successful holiday (no matter what time of year) is to have a plan. It doesn’t have to be complicated, but it has to be reasonable and actionable for you. So, if you haven’t already, get the guilt free holiday workbook. It will help you with that plan! 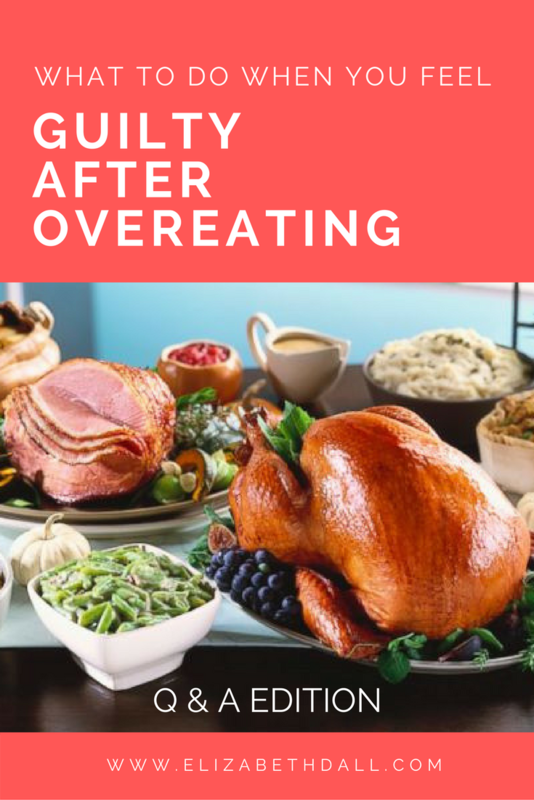 For this holiday, I polled several of my dearest friends in the health and wellness industry to ask them for their tips on enjoying food through the holidays without overindulging and feeling subsequent feelings of guilt, failure, and frustration. I shared all of their thoughts right here. But, my very favorite tip for avoiding the holiday free-for-all is to remind yourself that you can eat this food anytime of the year. You can get a candy bar any day you want, not just Halloween. You can make mashed potatoes and gravy for dinner any night. Heck, you can even make my favorite sweet potato casserole or whip up a batch of stuffing any darn time you please. It’s true, there will be some things you like to indulge in during the holidays and that’s ok. Choose a few special dishes that you want to enjoy and enjoy them. Food is meant to be enjoyed. But remember, you can always come back to them any time during the year. Tell yourself that at every event or any time you are tempted to overindulge or overeat. You can eat this anytime you want. Then, remember the plan you’ve created for yourself and enjoy. The holidays are meant to be enjoyed, not just endured. Every day is meant to be enjoyed and not just endured. I hope these tips have been helpful as you navigate the holidays, your relationship with food, and your future goals.